Before getting into the notes from this busy week, we ask that you please consider participating in our 2013 Annual Drive. Several other terrific articles have been written about Bogaerts since news of his promotion broke. Alex Speier of WEEI.com documented Bogaerts' coming of age, which puts his historic performance in Double-A into context, and Brian MacPherson of the Providence Journal, who along with colleague Tim Britton is pushing the Xandemonium phrase, talked with PawSox manager Gary DiSarcina about how Bogaerts has changed since he first met him as a 17-year-old. With all the attention on him in his Triple-A debut, Bogaerts collected three hits and a walk in a doubleheader, including a home run that almost left McCoy Stadium. A player who may be joining Bogaerts in Pawtucket soon is Portland starter Anthony Ranaudo. Ranaudo tied the Sea Dogs record with 13 strikeouts on Thursday, a performance that earned him a second place ranking on this week's Baseball America Prospect Hot Sheet. After the Rule 4 Draft concluded last Saturday, news about signings has been trickling in. The biggest signing so far was securing third-rounder Jon Denney for only about $200,000 over slot. Some projections had Denney receiving almost twice the amount of the $875,000 he signed for. Denney, who was rated as a first-round talent by several major publications, should see time in the Gulf Coast League this summer. The largest bonus given out so far has been to second-rounder Teddy Stankiewicz, who signed for $1.1 million. The team has agreed to terms with several other players, with only 19th rounder Gabe Speier receiving an over slot bonus. Brandon Workman made his Triple-A debut this week, allowing three runs in 5 2/3 innings. Workman told Josh Jackson of MILB.com that he was not sharp, but that he has a lot to build on. The short-season leagues start next week, and the rosters are pretty much set. You can view them on our Team Rosters page. Alex Speier had a good article that broke down several of the top players on the Lowell roster, including Manuel Margot, Ty Buttrey, Tzu-Wei Lin, and Williams Jerez. Aaron McFarling of the Roanoke Times talked with Henry Owens (pictured) after his great performance on Monday, and Owens talked about how he dealt with a 45-minute wait before he took the mound, as Salem scored eight times in the top of the first. 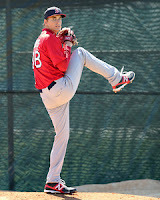 SoxProspects sources confirmed that Greenville right-hander Pat Light has a partial tear in his hamstring, and he will be rehabbing in Fort Myers for several weeks. Daniel Bard was placed on the disabled list with a strained abdominal muscle. Bard, who had not pitched since May 15, was trying to regain his confidence after struggling mightily after his demotion to Double-A. Former Red Sox outfielder Gabe Kapler wrote a piece for WEEI.com about the determination of late-round picks in the MLB draft. After missing the beginning of the season with a calf strain, Alex Hassan returned to action in Greenville, where he put up a 1.202 OPS in eight games. The Red Sox quickly moved him up to Pawtucket, where MacPherson reports he will be playing some first base for the first time in his professional career. This move will add some versatility to Hassan's defensive profile, while also alleviating a bit of a logjam in the Pawtucket outfield. As always, you can follow all the roster moves on our Transactions page. A lot of moves were made this week so be sure to check it out.